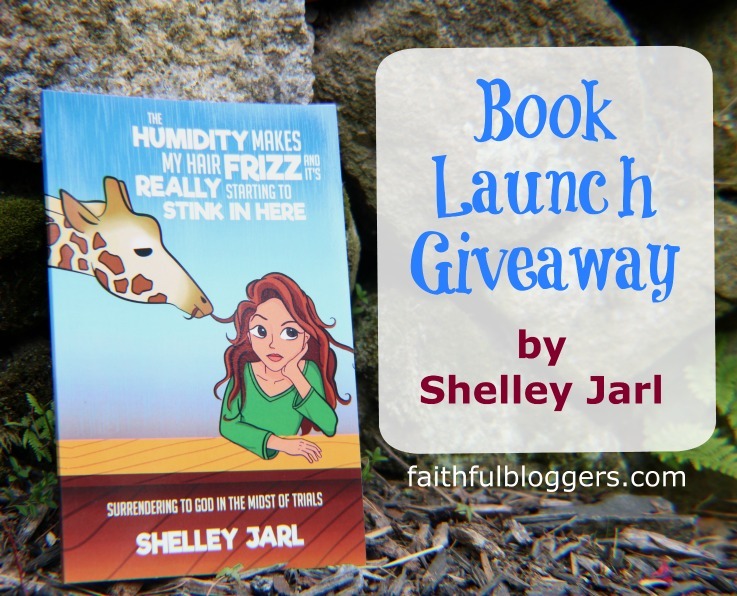 To celebrate the launch of my book, The Humidity Makes My Hair Frizz and It's Really Starting To Stink in Here and to say thank you to everyone who helped and encouraged me in this journey, we're hosting this awesome giveaway. I'm quite certain you don't want to miss this so be sure to fill out the widget at the bottom of this post. a signed copy of The Humidity Makes My Hair Frizz and It's Really Starting to Stink in Here. "Through scripture, Shelley proves God is with us in dark valleys. Her life experiences are not ones we all have experienced but are ones in which we can translate to our own trials and gain comfort exampled from the "angels" in her trials. We see God's provision for her and her family and relate it to our own. Through study questions, Shelley shows us the strength we find through scripture. In her directives for prayer, she guides us in HOW to pray and WHAT to pray during our particular trial(s). In this book with the hilarious title, you will laugh, you will cry, and you will be blessed!" To purchase Shelley's book go here, it is currently at a limited time sale price for the launch. You can get the Kindle version for only $.99. My friend Yvette asked me how things were going with my ministry and blog. With all the trials I have gone through (as you may have read in my prior post) I have found my writing to be at a standstill. I understand this is to be expected as I have needed to go through a period of healing. But as I began to take steps to normalcy, I felt as though the mire was holding my feet so strongly I couldn't even figure out how to take the first steps. "Yvette, that is no help at all." I mean, really, people don't want to know what it's like to be stuck. Lot's of people are stuck. If you're not, trust me, stuck stinks!!!! I also thought, "I certainly can't write about how to get unstuck because if I knew how, I'd just do it." I had been stuck before but somehow this stuck was bigger and more daunting. I'm unstuck now, or at least well on my way, and here's what I've learned. Bigger stuck and little stuck require the same solution. Bigger stuck just requires MORE of the solution, and it has three parts. I know this may seem contrary to where you are trying to get to but really, sometimes you just have to embrace the stuck. I'm not talking about embracing the stuck indefinitely, I'm talking about embracing God's plan. If God has you in a period of being stuck, examine your situation and see if He is asking you to take time off for renewal. Fallow ground is mentioned many times in scripture. 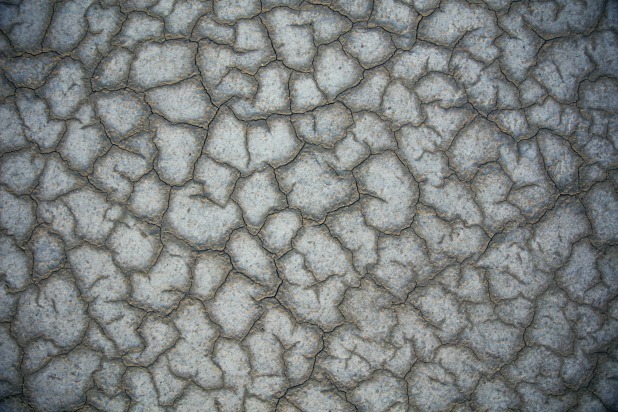 We think of fallow ground as cracked, dry, and lacking growth. But under that dry ground rest and renewal is happening. When a farmer has a fallow field it is intentional. Fields are left for a period of rest because the farmer knows that if he plants in that field when all the nutrients are depleted the crop will not produce well. We are like that field. Without a period of rest and renewal, we too are not capable of producing good fruit. Just trust me on this… embrace the stuck. During your fallow ground period spend tons of time in prayer. Don’t focus on getting unstuck, focus on God. Let Him do the unsticking and let Him do it in His timing. If you attempt to push something forward before God’s perfect timing, things are bound to not go well. Pray about everything. Ask God for guidance and wait patiently for answers, and don't act until you have them. At the end of your fallow ground period, you'll eventually have to step out in faith. There are two accounts in scripture of times when God parted water for the Israelites to walk across on dry ground. One is in Exodus and one is in Joshua. One involves Moses leading, the other involves Joshua. Both times the men were asked to do something before God parted the water. We hear from God through spending time with Him. You should never jump to step 3 with out completing step 2 (Prayer). After you spend time in prayer, what is God asking you to do to step out in faith? What is the first step He is asking you to take in order to get unstuck? Take that first step. Get in the water. The second and third steps will shortly follow and you will suddenly find you are no longer stuck. UPDATE: Yvette called...she said "The blog post is great but you forgot something." She said "You forgot to say, 'Yvette was right'". So here you go... Yvette was right! There is an issue which is huge problem in the world of blogging. That issue is: how to ask to guest post. I suspected that Faithful Bloggers was not the only website frustrated by this issue so I sent out a survey to some of the Faithful Bloggers community who I knew participated in guest posting either on the giving or receiving end. This post contains their responses and some helpful words of wisdom. When you are just starting your blog you need to consider if you are going to start an email list and which email server you are going to use. Not everyone who starts a blog has to have an email list. But for the vast majority of people who blog, the question of whether or not you are going to collect email addresses should be answered with a “yes”. Once you decide to start a blog, have settled on which platform you are going to use and have begun to design it, then it's time to install Google Analytics. Google Analytics is a powerhouse of a tool which can provide you an abundance of information about your blog. You can then utilize that information to improve your blog or website. Best of all: Google Analytics is FREE!!! It is important to install Google Analytics right from the start. That way you can track and watch the growth of your blog over time to see what is working and what isn't. When you write and publish a blog post, Google Analytics will let you know which of those posts your readers are responding to the most. Then you can write more posts with similar or complementary content. Another reason you want to install Google Analytics immediately is so you have history. If down the road you want to sell advertising on your website, or need any statistical information for any reason, you'll have it. If you wait to install Google Analytics until the moment you need the statistical information, you will have no historical data and you'll regret not doing it right from the start. Installing Google Analytics on your website is not a difficult task. It is a matter of logging into your Analytics account and finding your tracking code and installing it in the appropriate place on your website. This will be done differently depending upon which platform you are using for your blog. You will be able to see in your "real time" dashboard on Analytics if your tracking code has been installed correctly. If you are having any trouble with the installation of your tracking code, search in the Google Analytics help section for a step by step walk through. I hesitate you give you any directions because as soon as I hit publish, google will change where things are located on their Analytics site and my directions would be obsolete. If you have never logged into a Google Analytics account before, at first glance it can seem overwhelming. There is a ton of information to be found once you log in. My advice to you is, make a cup of tea, set aside a good chunk of time and just start clicking. The best way to really familiarize your self with what is in your Analytics account is to simply explore. Keep in mind as you explore around in Google Analytics, there have been entire courses and books written on how to get the most out of Analytics. Take your time and don't expect to learn it all in one sitting. A couple of the things you should track over time are the number of Unique Visitors to your site as well as your Page Views but this is just scratching the surface. As you familiarize yourself with Analytics, you'll be able to see where your readers are coming from geographically, what pages they are spending time on, what pages they go to from another page and so much more. You'll be able to find out which of your social media accounts is driving the most traffic to your website. This will let you know which social media platform you should be spending the most time on. You'll also be able to see how your readers have responded to something such as an Adwords campaign. If you do not have Analytics installed on your website, go do it today. If you would like a form to help you keep track of the information which you gather from Google Analytics we have added a "Website Stats Tracking Form" to the resource library (for FREE). You can access the library with the password which will be emailed to you by filling out the form below. If you do have Google Analytics installed, what information do you find the most useful to track on your own website? Not being a fan of video games myself, I admit I was skeptical when the random number generator choose a gaming site for the next directory spotlight. However, I reached out to the owner of the site and found a man who not only loves the Lord but who could write on a topic which I am unable to write about. Whether you are a "gamer" or not, I encourage you to read His spotlight post. You will be glad you did, especially if you have children or grandchildren who enjoy video games. It is my honor to introduce you to a man who is using his passion to honor the Lord....Michael Morejon. This post contains affiliate links, which means if you click links we may receive some compensation at no additional cost to you. One of the most important things to consider before you start your blog is how you are going to keep your blog business organized. Some of you may not be blogging as a business, I understand, but it would still be helpful to you to get a good system of organization in place. If you set up a good organizational system right from the start you will save yourself a lot of headache later. Let's take a look at some of the basics of organizing your blog business. I am a firm believer in the process of planning. Planning has had a huge part to play in the success of our family businesses. Trust me on this, right from the start of your blogging journey, create a plan. You will not regret the time spent on planning. There are two types of plans I would suggest you write. The first is an overall plan for your year. This would include your goals for your blog business but would also include your goals and plan for your family, other work, etc. This planning does not have to take place at the beginning of the year, you can put a plan in place no matter what month you are currently in. If you need a resource to help you with your yearly planning, take a look at our course called "Write a Yearly Plan", it's a faith based yearly planning course. The second type of plan you should create is a blog plan. You can do your planning with a calendar or other type of planner but if you are looking for a great resource to assist you check out "Epic Blog", it's a one year blog planner. It's a very helpful resource. It is super important to set up a system right from the start for keeping track of your blog business bookkeeping. I personally use Quickbooks and it works well for my needs. In addition, by using Quickbooks, I am ready with all the paperwork needed when tax time rolls around. Whatever you choose to keep track of your income and expenses, get it set up right away. Right from the start decide on a system to keep track of all your login and password information. Don't make the mistake of thinking you are going to remember them all and don't make the mistake of thinking you will use the same password for everything...it won't work! Some password requirements are different than others and require symbols or different number of upper and lower case letters. Just choose a system and use it for every single place you have to log in to. You can use a word document, or open up a notepad. You could even use paper and pen....whatever you choose is fine. Just get it set up. There are also password apps available if you prefer to keep track of passwords electronically. Create a place to capture your blog post ideas. I use a combination of post it notes on a board in my office and I also use a binder. I jot down ideas onto post it notes and put them on the board. Once they become more than a single thought I transfer them to a blog post planner sheet and put them in a binder. Here is a link to read about and access for free the exact blog post planner which I use. If you prefer to keep track of things digitally you can use something like Evernote or even just use your notepad in your smartphone. Even if you use a paper version system for keeping track of ideas it is good to have a plan in place for capturing these ideas when you are out and about and don't have your paper system on hand. When I am out and have ideas I add them to the notepad in my phone. Set up a system for your paper files. Get yourself a file cabinet and some hanging as well as manilla folders. Set up your system and use it daily. Then set up a system for your online files and documents. Set up online storage using something such as Dropbox or Google Drive. Organize your online files using folders and create a system which makes sense to you so you'll be able to find things when you need them. These are just some of the things which you will want to have a system for. Think through all aspects of your blog business and put systems in place for everything. Setting up systems for keeping your blogging business organized right from the start will save you much frustration and headaches later. What are some other things you have found important to organize for your blog business? Part 1: Why Do You Want to Blog? Part 2: Which Platform Should You Choose? Part 3: Who is Your Audience? To access our members area and the free resources fill out this form. This post contains affiliate links, which means that if you click links, we may receive compensation. I am excited to write this Directory Spotlight because I am writing it out of my personal experience with the individual/business which is being spotlighted. Have you have ever stood on the scale and stared in discouragement at the number? I’ve known for quite some time that I needed to make some changes in my life. I knew this because my health, as well as my scale, told me so. I have always been skeptical of many weight loss “programs” and “diet fads”. I knew when it came time to make changes in my life it was going to have to be in a way that was not “fad” like in nature, it had to be in a way I could feel good about. In all honesty, I was not treating my body like it was the temple of the Holy Spirit, I was not taking the time to take care of me and I certainly was not honoring God with my body. At the same time as I was considering the changes I needed to make, and asking the Lord for guidance, He connected me to a biblically based health and fitness program I could feel good about participating in. It was a program right within the Faithful Bloggers Directory. Let me introduce you to Five17 Fitness and Tyler Inloes, my personal coach. I am currently 12 days into a 40 day fitness challenge withFive17 Fitness. When I set the date I was going to begin the challenge, I was so excited to start. Then just a couple days before the date I chose to begin, I injured my foot, like seriously injured it. But I made the decision that healthy is healthy, foot injury or not. So, I told Tyler about my injury and he too encouraged me to begin anyway. And so I did. I have had to make adjustments to accommodate my injury. I cannot do any exercise which bends my foot at the ankle. I also can do almost no cardiovascular types of exercise (walking, running, jumping motions, etc.). Talk about needing to get creative. If I can do this with my injury, so can you! Because of my limitations with my foot, I do believe my progress may not be as swift as other people may experience, but I’m good with that. Healthwise I feel great. I’ve received daily spiritual encouragement right from scripture. I’ve learned so much about God’s plan for my health. There’s been someone behind the program who really cares about me, my family and my health. All of these have strengthened my faith, just like the Five17 Fitness tag line says (lose weight & gain faith). Tyler is hosting a live webinar this Thursday, June 15th at 1:00p.m. The Holy Detox: How to Lose 10 Pounds in 5 Days using the Bible. The link to register for the webinar is below. I encourage you to register for the webinar, (I’ll be there!). If you are feeling run down, and haven’t been taking care of you, then maybe that one hour could be the kickstart you need (just like I needed) to get your healthy journey started. Or you could jump right into the 40 day challenge and join me on the journey (this link to the 40 day challenge shows you everything that is covered during the challenge). It would be so exciting to have others on this journey with me, maybe we could encourage each other! If you begin, email me and let me know. Either way, check out the Five17 Fitness website and tell them Shelley sent you. I want to say thank you to Tyler Inloes for using his passions to bring honor and glory to the Lord! I am on a mission. My mission is to transform as many lives as possible through faith and nutrition. I’ve seen first hand how eating biblically can transform people’s lives. And I know that if I can help take your nutrition to the next level, more lives will be changed. Claim your FREE spot now! In the interest of fostering a community where we lift each other up Faithful Bloggers has started a collaborative board on Pinterest. This is a place for you to promote your own stuff but to also gives you a chance to give back to the Christian community, a win/win for everyone. Our Collaborative Pinterest board is meant for you to share anything which would resonate with Christians or bloggers. Your pins do not have to be related to the topic of blogging. So, come join us and start pinning! WOO HOO!!! We have a new resource available which we think you are going to LOVE!!! And it's FREE! We all love free right? It can be found in the members area. To access the members area fill out the form below. HOW TO WRITE YOUR TESTIMONY is our latest resource to help you share your God story. HOW TO WRITE YOUR TESTIMONY will walk you step by step through the process of writing your testimony. 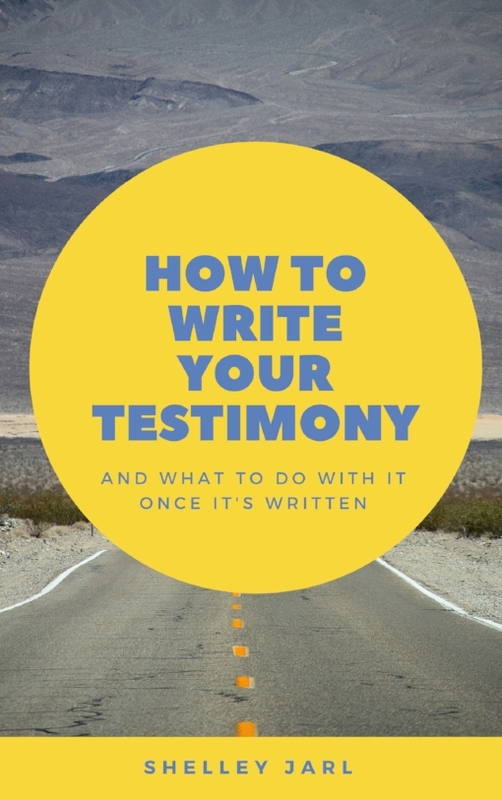 It comes with worksheets and ideas for what to do with your testimony once you have it written. We're so excited to hear about your testimony getting written and your plans for sharing it with the world. If you just want to access this resource and are not interested in joining the giveaway, simply fill out the form in the sidebar, you will be emailed the current password to our member area where you can access HOW TO WRITE YOUR TESTIMONY as well as other resources. This giveaway includes a box of beautiful cards to color One is Psalms to color, the Other is Proverbs to color. Two winners will be chosen, each will get one box plus a variety of items perfect for art or mixed media journaling. UPDATE: This giveaway has ended. Congratulations to our winners. Dianna and Elaine...enjoy your goodies. Thanks to everyone who helps us get the word out about our new resource HOW TO WRITE YOUR TESTIMONY. We are very excited about it being used to help people tell their God story. This post contains affiliate links, for more information see our affiliate statement. This is an important question to ask yourself before you even set up your blog. Finding your niche first can provide you direction when it comes to naming your website or blog a name which will resonate with your readers. It can also help guide you in your decision regarding the colors and branding look which you choose for your blog. In addition, when you brainstorm a list of potential writing topics for blog posts, knowing your niche will help the ideas flow more freely. If you are a Christian blogger, you have tremendous opportunity online to share regarding your faith. When people arrive at your blog or website you want them to stay awhile. The best way to do that is for your site to have a clear purpose. There must be something there which resonates with them in order for them to stay. If you are a gardener who also loves fashion and cooking, these three things may be too disconnected in the mind of your reader for you to write on all three topics. for example, if someone who is seeking gardening tips arrives at your website but the page they land on has an article on the new dress you purchased and how stylish it is, you will probably lose the reader. However, if you choose to write about your gardening adventures and you also include cooking and recipes using things you've grown in your garden, now you have an attentive audience. You could even throw in an article or two on the latest gardening hat to protect gardeners from the sun while gardening. This way you are adding in your love of fashion but still keeping it focused on gardeners. How to find your niche audience. When choosing your topic, one very important thing is that you be interested in it. You will be writing about the topic for a very long time and it will get boring quickly if you don't like the topic. Narrow down your audience. By this I mean, don't just write to computer geeks, write to computer geeks who play games or computer geeks who build websites. Don't just write to moms, write to Christian homeschooling moms. Don't just write to those who have lost a loved one, write to those who have lost a child, or who are single after the loss of a spouse. Narrow it down and then write to that audience. Make sure when you narrow it down, you don't narrow so much that there isn't enough to write about. If you are not sure who you want to write for begin by making a list of the things which you love. What are the things which resonate with you or which you enjoy doing in your spare time? Your hobbies and interests are topics which you would probably enjoy writing about. They are also the topics for which you would probably have the greatest ease coming up with content. If you need ideas for possible niches there are many places to go for ideas. Take a trip to your local library and browse the books. Go to the non-fiction section and notice how the books are broken down into categories on the shelves. All the computer books are together, all the business books are together. They are even further broken down into business start up, business funding, business marketing, etc. As you browse through the books, notice the topics you are drawn to, those are good potential niches. You could also visit a store which has a large magazine selection. You'll notice magazines are written to niche audiences. Home magazines are written to southern home owners, or owners of barn homes, or to those who like DIY projects at their home. They are also written to those who like the cottage look, or those who like victorian style, or those who prefer contemporary style. Magazine niches also make good blog niches. Another thing to think about as you are finding your niche is that a niche is solving a problem. For example, for the above magazine readers the problems might include "How do I decorate with cottage decor? ", or "How do I do that DIY project?". The problem a person might need solved could be as simple as "What is the next knitting project I'm going to knit?" (and you'll provide the answer), or "What can I cook with all this zucchini from my garden?" (and you, the expert gardener, will provide the recipes). Another way to explore possible niches is to visit www.amazon.com and browse through the categories. Read book reviews. If a book topic resonates with you, explore what other subjects that author has written on, maybe they have a niche they write for. Take a look at article websites such as ezinearticles.com. You will see that their categories are further broken down into subcategories. These subcategories are all possible niches for your website or blog. There are a few things you should consider as you choose your niche audience for your blog. One thing you must take into consideration is the answer to the question which we asked you in the first post in this series "Why Do You Want To Blog?" If your answer to this question was that you are blogging for a hobby or for personal enjoyment then your niche won't matter a whole lot. However, if you are blogging for profit, or to grow a business or ministry, or even if you are blogging for a hobby but would very much like to grow a following then choosing a niche is important. If you are blogging in hopes of making any money from your blog, you will need to choose a niche which can be profitable and for which you can produce ongoing content. Explore how much demand there is for your topic, then explore how much competition you'll have. Can you produce amazing content on the subject? As of 2013 there were 152 million blogs on the internet. If you want to be noticed you are going to have to put out some pretty amazing content. Competition can be fierce, but it can also be a good thing if we allow it to push us on to excellence. Are you giving yourself enough flexibility? As I mentioned before, don't narrow down the topic to the point of not being flexible or not providing enough possible content. Am I going to love this topic forever? Or, is this hobby I'm currently enjoying just a passing phase? I hope your gears are turning with thoughts of possible niche audiences you can write for. Go visit your library or book store and write down possible ideas. Then once you have chosen a possible niche spend some time brainstorming a list of potential topics you could write on which fall under that niche. If you can brainstorm a decent list of topics, then you may have found your audience. (part 1 of 10) Why do you want to blog? (part 2 of 10) Which Platform Should You Choose? To receive regular tips and downloads to help you in your blogging journey, sign up below. In addition, when you submit the form below, you will receive a password to access our member area where you will find helpful resources. Which platform should you choose for your blog? This post will help you answer that question. Why do you want to blog? This is the first question you need to ask yourself before you start a blog. Answering this question right from the start will enable you to set it up in the best way for you to reach your goals, whatever they may be. This week is Consider Christianity Week. It's a perfect time to write a post for your blog discussing your testimony, or the powerful impact a relationship with Christ can have in the life of a Christian. Why not share about the freedom and forgiveness which can only be found in Christ. I created this graphic (image) for Consider Christianity Week. You are welcome to take it and use it if you are writing about Consider Christianity Week (not sell it). I intentionally left off the www.faithfulbloggers.com text which I normally add across the bottom so you can use it for your own blog post if you desire and you are even welcome to add your website text at the bottom. If you do write about Consider Christianity Week, please leave a link to the post in the comments. With the end of March comes the end of the first quarter of 2017. It's time to evaluate how your first quarter has been. Are you happy with the direction your year is taking? As I sit down to do my quarterly review as I do each and every quarter of the year I ask myself the above question as well as: Am I on track for the plan I set? If I am, what adjustments might be necessary? If I'm not, do I need to adjust the plan or adjust the actions in order to get back on track? If you've ever wondered how some people can accomplish so much in their life and yet you seem to remain stuck, they are probably using the practice of planning. Planning is purposeful. It is purposefully putting a plan on paper and creating steps to help you accomplish your goals. With the end of this quarter I want to encourage you to consider how your year is going and if you haven't written a plan for the year, go ahead and write one. The end of the quarter is the perfect time. Writing a yearly plan can taken place any time during a year, not only at the beginning. Next Tuesday we will be launching a new product called "Write a Yearly Plan", it is a faith based yearly planning tool. It will only be available for a limited time. This is the exact planning tool I use to write my yearly plan. In addition, if you'd like to join us, we will be talking about planning and our individual progress on the Facebook page. So, I encourage you to get busy either conducting your review or writing your plan. If you need a resource to help you accomplish that, watch for the release of "Write a Yearly Plan" on Tuesday. Are You Using a Blog Post Checklist? Last week I wrote a post called "Why You Need A Blog Post Planner". Today I'm going to tell you about the second tool you need for publishing a blog post, it's the 'blog post checklist'. As I mentioned in the other post, a planner is your tool for planning your post, but the checklist is used to make sure you included everything in your post prior to publishing. It also helps to ensure you complete all the tasks you need to complete as you publish your post. The checklist helps you to remember all the things like, adding meta tags or descriptions to photos, publishing to social media, resizing photos for quicker load times, etc. Both the planner and the checklist are tools you can use in your blog planning. Watch for our planning tool called 'Write a Yearly Plan' to be released soon which can help you in planning all areas of your life including your blogging ministry or business. Watch the video for more information on blog post checklists. Fill out the form below to join the list and download the checklist. When you submit the form below, you will receive a password to access our member area where you will find the blog post checklist and other helpful resources. NOTE: I am not being paid by Squarespace or Wordpress for this post. There have been lots of exciting things going on behind the scenes here at Faithful Bloggers. We've been planning and prepping but in addition to all that, we've been super busy with moving. By moving, I don't mean an actual physical move, I'm talking about a move from one web platform to another. We moved from Wordpress to Squarespace. I have moved (physically) a great big number of times and although a physical move has it's challenges, a web platform move has it's own unique set of challenges, none of which are any fun at all. As you all have read, Faithful Bloggers changed ownership. At the time of purchase, Faithful Bloggers, Faithful Devotions, and The Faithful Bloggers Directory were all on Wordpress. I wanted to make that work, really I did. But I just couldn't. I know I'm probably about to get a bunch of you upset with me, but before all you Wordpress diehards get all hot under the collar, hear me out and read this entire post, because I really do believe Wordpress has a place, just not for me. And I think it may possibly not be the best choice for many other people, depending upon what they are looking for. You also should know, this was not my first experience with Wordpress, I've been there before. I know there are about a bazillion websites on Wordpress, I know it's a great platform, but it is not the only platform, and it's not the platform for me. I believe it really depends on what you are looking for whether Wordpress is the place for you to call home. Below is a run down of the pros and cons of the two platforms, so if you are just starting out, you'll be able to make an informed decision. And if you are dealing with any frustrations with either platform, you'll have an idea of what the other offers. Please note: Any time I mention Wordpress, I'm talking about a self hosted wordpress site. So why did I move? Squarespace has an incredibly clean, clutter free interface. It's also easy to use. Like any sort of software it does have a learning curve, but it's click and drag format is generally user friendly. Also, if you are just starting out, you should know that there will be a learning curve on either platform, but I feel it's fair say, you will have a longer learning curve on Wordpress. Live Chat! I love this about Squarespace. When I have questions, I can just hop on live chat and get assistance immediately. Granted, their live chat is only available during daytime hours (eastern time zone), so you 3:00a.m. bloggers may not find this a benefit (unless of course you're a 3:00 a.m. blogger around the world from the eastern time zone). Domain, Design, and Hosting all in one location. I cannot say the transfer of the domains to Squarespace or the transfer of the entire site to Squarespace was the easiest thing I have ever undertaken (it isn't even in the top 10 easiest things). In all honesty, I didn't have to move the domains to Squarespace, that was a choice I made to have everything in one place, taken care of by one group of people. I know, Wordpress is free, but hosting is not and I'm paying similiar for Squarespace as I was for self hosting with Wordpress. The other thing that is not free (if you are considering Wordpress) is if you need someone to fix code or anything else for you. With Squarespace you are a paying customer, so unless you've monkeyed with the code on your site, they are there for you. If your Wordpress experience has been to email on a regular basis with your hosting company to get things fixed, you'll probably love Squarespace. I tried to recall if there had ever been a time when I had to email Squarespace, and although I can't say for sure, I don't remember any. I have used their live chat a few times. I HATE CODE. I mean, I REALLY hate it! Some people love it, some people tolerate it, some people hate it, I'm definitely in the third group. I have no business playing around with the inner workings of my website, nor do I want to. With Squarespace I don't have to deal with code. There are times I may have to copy and paste a portion of generated code into a code block but other than that, no code. This does not mean that those people who love code, can't access coding on Squarespace. If you are of the "I Love Code" camp, you can code to your hearts content on Squarespace. Here however is where I think Wordpress has a place. If you are the type of person who absolutely has to have the ability to manage every detail of your website, and you love that stuff, Wordpress will probably feel like home. But if what you are looking to do is write and blog and not have to deal with code hardly at all, you might want to consider Squarespace. No 3rd Party Plug-Ins. There are about 5 million plug-ins (I might be exaggerating just a little) available on Wordpress. They are used to get your site to do just about anything you can imagine, there are probably plug-ins to get your site to do your laundry for you. Having so many options has it's positives and negatives. On the one hand, you have options. Options are good. Except at times, I found the options overwhelming. On the other hand, Wordpress is an open platform and anyone can author a plugin and make it available on Wordpress, this too is good and bad. Once your Wordpress site is up, you are going to load lots of plugins on your website, because you need them to do things like add forms to your site and numerous other tasks. These plugins are all authored by different people and they all need to be updated. If you overlook updating them, this is where issues occur. This is the open door hackers use to hack Wordpress sites. When I purchased Faithful Bloggers, it had been hacked and neither myself nor the prior owner, Tishia, were even aware of the hack till I started poking around in it. To some people, these next two things might seem nitpicky, but I'm creative and very visual so these were big for me. There were a few things design-wise in Wordpress that drove me batty. The first is the themes. Even though there are thousands of them, you read the description and it says "custom color", but then you load the theme and begin the preview and by "custom", they meant you can choose from, blue, red, pink or green (or some other limited selection depending upon the theme), that's not "custom". Granted, there are some which offer true "custom color" but why on earth do I have to go through the process of loading them and begin the preview process in order to know that for sure. The other design thing that drove me nuts is when I was choosing a font in the theme, which you can't do in all themes, the drop down menu just had the names of the fonts, all written in the same font, not in their own font. So I had to actually try the font in order to see what it looked like. I know there are premium themes which you can buy on Wordpress and they probably offer more flexibility, but it seems to me that out of thousands of choices, there should be a couple that don't drive me nuts. Wordpress does offer tremendous flexibility, if you know code or are willing to pay someone to make the changes you are wanting. Squarespace uses templates as well, and there are many less templates to choose from, however, I have found they are much more customizable for someone who doesn't want to deal with code. The font on any part of my website can be any font I want it to be and the color is truly customizable. I need to have the capabilities to do these things myself, to do them quickly and efficiently, and without having to play with code, Squarespace offers me that. It's Just Easier. Less monkeying around with back end stuff frees up more time for writing and blogging. As I said before, I'm looking to write and blog, not play with my website. When you write a post on Squarespace and you need to insert anything, a form, code, a calendar, a map or a whole slew of other options, all you do is click to add it right there in the text. You don't have to go to a plugin to get your form. See this videofor more details. I have another site on Squarespace which I have had with them for 7 Years. In that time, I have never had my site go down, and I've never had an issue with messed up code. It's also never been hacked. I know there are first times for everything and I may just have been fortunate but it's a pretty good track record. A couple other things you might want to know about Squarespace. Your website doesn't have to be a blog. This wasn't important for me for the Faithful Bloggers website but it is for the other business my family owns, and it might be for one of my readers so I'm including it. On Squarespace your website can just be a website. Our family business website does include a blog but it has a non blog front page as well as many other pages. If you'd like to check it out visit www.homecareNHME.com. You may notice it has a similar layout to the new Faithful Bloggers site, you should know this was intentional, not required, there are plenty of other templates. I used the same template for simplicity for myself. I felt that because the sites were so unrelated industry-wise, no one was going to say "boy your site has a similar layout to the Faithful Bloggers site", (except, all of you now). I also could have made that same template look very different. One other thing you may find useful to know is that on Squarespace you can have more than one blog on your website. If you want to see why anyone would want or need that, take a look at this very website. The main Faithful Bloggers website is set up as a blog, but if you click on the "Directory", that is also set up as a blog. Then you can click on "devotions" and that is set up as a blog as well. 3 blogs, all on one website. Just because I discuss the ease and simplicity of Squarespace, does not mean that a Squarespace website can't have all the bells and whistles. You can build a very dynamic and professional site on Squarespace (again, see the website I mentioned in the prior point, it has pretty scrolling images on the front page). A few things about actually making the move. I mentioned earlier that the move was not easy, but don't let that scare you. If you have a straight forward blog with minimal things which would make a move challenging such as signup forms, etc., then if you decide to move to Squarespace it will be relatively easy and straight forward. The things on the Faithful Bloggers site which made it difficult were things like the forms, and the directory and a few other challenges like that. If you decide to transfer your domain to Squarespace (which is not required), you should know the transfer can take from 1-15 days, my tranfer took 6 days (I'm not very good at waiting). If you have a mailing list, Mailchimp integrates better with Squarespace than Aweber or other email services. You can use the other services with Squarespace but Squarespace is set up so you can automatically connect to Mailchimp when you load a form. I moved the entire mailing list from AWeber to Mailchimp which made the move more challenging. UPDATE March 2018: I moved my email platform to Convertkit. If you are the code loving, website fidgeting type I would recommend Worpress for your platform. To go along with Worpress I would recommend MomWebs.com for hosting (their tech support is very quick to respond). I also recommend AWeber or Convertkit for your mailing list. However, if you are the, "I just want to write and blog and not monkey with the backend" type, I recommend Squarespace, and for your mailing list, I recommend Mailchimp or Convertkit. When I first saw it a few years ago I wasn't sure what I thought of it. Then I recently watched it again and it really struck a nerve with me. Maybe it impacted me more this time, versus a few years ago, because before my grandma passed away this February we had a conversation about how I've let fear hold me back from doing so many things I want (traveling alone, speaking - just to name a few). "Tishia, only God really knows how many days you have here but life is short so stop worrying about what everyone else things and please quit living in fear. Get out there and enjoy life!" We went on to talk about how proud she was when I took a leap and started my Virtual Assistant Business back in 2006. We talked about how God has provided so many great opportunities for me since coming online. We talked about how there were so many things she was proud of doing (her missions trip in Guatemala just to name one) in her lifetime but the thing she regrets the most...all the things she didn't do! "Grandma, I feel life is passing me by and I'm sitting on the sidelines watching everything happen but I'm not participating." And while I've changed a few things since sharing that with her, I'm still watching from the sidelines. The main reason...I'm scared. I want to head out and explore (I'm not even talking heading to the other side of the world on some big travel adventure - I'm talking local travel right here in Michigan...there are sooo many places I haven't experienced, and some other travel adventures like hopping on a train and just going somewhere, etc.) I know single women travel alone all the time, but there's a few people around me that don't think it's a good idea. And Lord knows I spend way too much time worrying about what everyone else thinks Tishia should or shouldn't be doing! I wanted so badly to cross the five mile Mighty Mac but the thought of driving over it sends me into full on panic mode. There are sooooo many things in the U.P. (upper peninsula) I want to explore but I can never actually get over the bridge to get there. Yes, I've been on the bridge before...as a passenger and that's bad enough. So once again, I left and headed back home. I'm sooooo tired of living on the sidelines. I so desperately want to get out there and enjoy the "game" and I know God doesn't want me living in fear. So, I'm bound and determined to start taking baby steps and within the next few months I WILL cross that bridge with God guiding me safely! I never thought I'd be learning life lessons from jelly beans! But what a creative way to get the point across! What do you plan on doing with the rest of the time you have? I don't know about you but setting New Year's resolutions has never worked for me. I'd get all excited towards of the end of a year and gung ho about going full force on New Year's Day with whatever resolution I had picked (90% of the time it was always about dieting and losing weight) and by the end of January (sometimes I didn't even make it a couple weeks!) I was right back to old habits. So, I gave up on setting resolutions several years ago. Then I switched to setting goals instead. And, well you can probably guess how that turned out. You're correct if you guessed a few weeks into a new year and I had given up on the goals too. Then, a few years ago, I was introduced to picking a word for the year - a theme so to speak. And this has worked for me. Of course, I'm a rebel and I usually end up with three words each year instead of just one ;-) Although, this year only two words 'picked me'. If you're interested in learning more about picking a word(s) for the year, You can see this year's post here. (NOTE - the resource mentioned in the post is a little on the "airy fairy" side as it talks a lot about manifestation and things like that). I used the resource mainly for page 11 - idea generator list. This is where my two words came from. And what I mean by they 'picked me' is that those two words jumped off the page, they tugged at my heart strings, and felt right.